The main page of this website features over 100 articles on Montana women, from activists and artists to pilots and politicians. The majority of these essays have now been pulled together into a 336-page book, Beyond Schoolmarms and Madams: Montana Women’s Stories, published by the Montana Historical Society Press in April 2016. 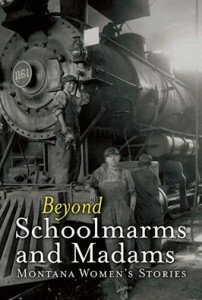 You can order your copy today from the Montana Historical Society Museum Store or your favorite local or online store. Though this site is no longer being updated, the essays will also remain available here for those who prefer online reading. You can also use the tabs at the top of the page to access bibliographies (current through 2014); over 130 articles published in Montana The Magazine of Western History; and to find educator resources, information on selected historic places, and resources specifically related to the suffrage campaign.